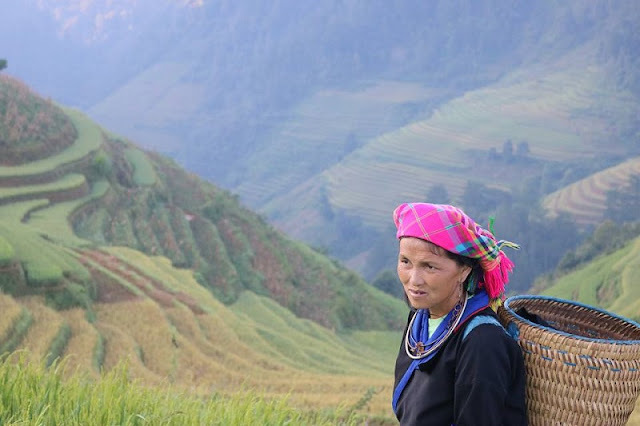 Home > Travel guide > What is Mu Cang Chai tourism? 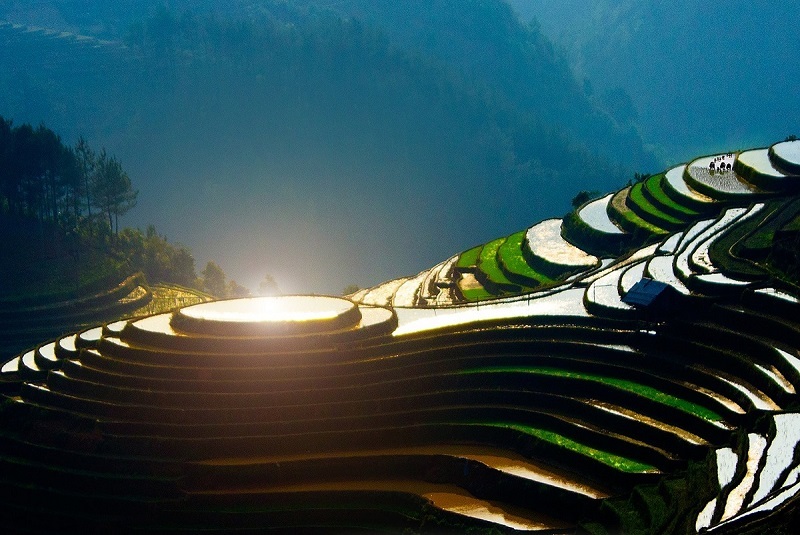 Mu Cang Chai – the land of the most beautiful rice terraces ! Mu Cang Chai is a highland district of Yen Bai Province, at the foot of the Hoang Lien Son mountain range. From Hanoi to Mu Cang Chai to go about 280km and pass Khau Pha Pass, one of the most dangerous and beautiful mountain pass. Mu Cang Chai is famous for its terraced fields, which are spread over the mountains so beautifully that it is ranked by the Ministry of Culture, Sports and Tourism of Vietnam. Every year, in the ripe rice season, about September - October, visitors everywhere to Mu Cang Chai to see the ripen terraced fields on the mountain. Mu Cang Chai is the home of some ethnic groups such as Tay, Dao, H’mong, Viet…..Among of them, Hmong accounts for 95 percent of entire population in Mu Cang Chai area.They are living scatteredly on the slope of high mountains and level the mountains into different steps for their rice cultivations – the great man-made creation of Mu Cang Chai rice terraced fields with rain water supply running down from Hoang Lien high mountain range. At the high location of Hoang Lien Mountain, Mu Cang Chai district has its two main seasons : the dry & rainy ones with cool summer & cold winter.There isn’t any river running through the district and its main water source is coming from numerous streams originated from Hoang Lien mountain range. 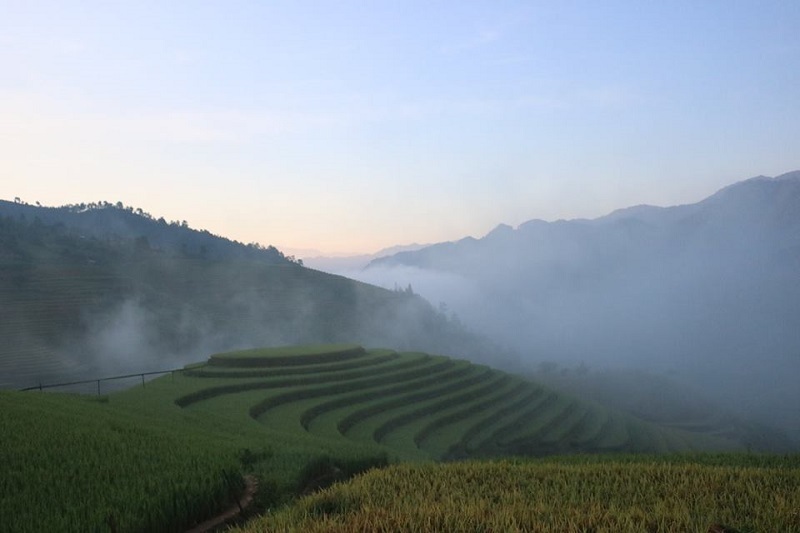 With its 6 cold winter months (November to April), the region is so cold & dry to plant the rice, that is why there is one crop of rice in Mu Cang Chai in summer season (May to October) when the rice terraces are watered by summer rains. In the first period: Approximately 5-6 months is pour water season, when the summer rains began pouring down the mountain, the water is led from the mountains on the terraces. Water spills into the fields making the arid soil softer and hatched so that the rice can be transplanted. This is also the time when farmers start plowing to prepare for a new crop. Therefore, in the mountainous terraced fields in the north, rice can only grow one crop. The ladder in the sun in the afternoon to create a beauty that so many visitors to be surprised. In the second period: Around mid-September to mid-October is the season of grain, at which point the entire Mu Cang Chai will yellow colored rice, the weather is nice and convenient to visit this place. The most appropriate time is from about 15-9 to 10/10 every year, before this time the green rice, after about this is almost harvested. There in Mu Cang Chai, terraced rice fields rise and fall around hillsides and mountainsides as well as streams and rivers, making them look like giant yellow staircases for people to step from earth to heaven. 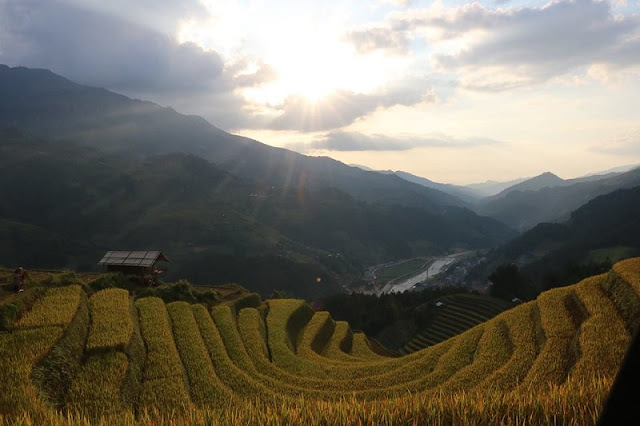 Terraced rice fields have been not only a source of food and income for the Mong people; they are an intrinsic part of their culture and Mu Cang Chai, which is itself a quiet town on the bank of the Nam River. Fashioned over many centuries, the yellow terraced fields are now a symbol of the Northern mountainous of Vietnam and make it one of the top destinations for visitors who love to experience, explore the diverse culture of ethnic minority groups.